This bulletin has been prepared to help pension plans understand the recent moves in markets, the impact on pension plans and to discuss some issues and topics to consider this year. A funded ratio shows how a plan’s assets compare to the actuarial assessment of the value of the liabilities. In short, it is the “value of assets” to the “actuarial value of liabilities”. Actuaries generally measure the liabilities in two ways, ‘going concern’ and ‘solvency’. We have focused on going concern as it is the measure most applicable to our plans. 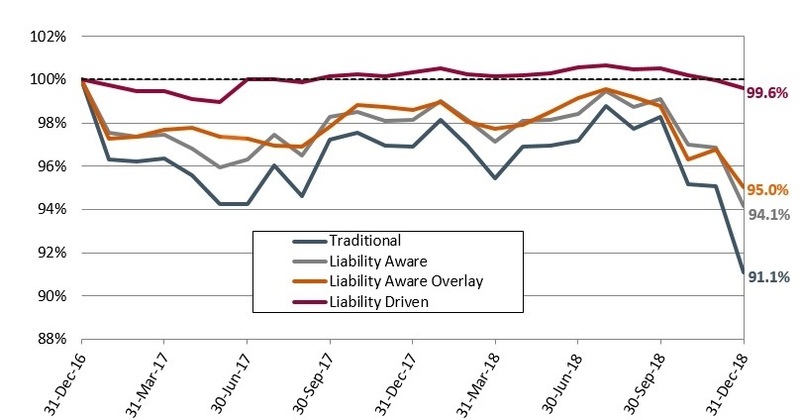 Liability Driven: 5% equities, 95% long duration bonds. The liabilities are assumed to be for a typical PBI client with an open plan, where benefits paid are equal to contributions in. Please note that for pension plans with different designs, liabilities or asset mixes, or under different funding regulations, results could differ materially. How market downturns impact the going concern funded ratio can be complex. The funded ratio is partially determined by the actuarial long-term discount rate. This discount rate is less influenced by short term market movements and more by the asset mix and other factors (such as changes in plan demographics, plan changes, and life expectancy). Over 2018, the PBI Pension Funding Indices were largely flat until the final quarter. During the first three quarters of 2018, positive equity returns offset by negative bond returns caused the PBI Pension Funding Indices to fluctuate. In the final quarter, a sharp decline in equities drove the Indices lower. The relationships between funded ratios and the market are complex. The PBI pension index indicates that plans with very low, or no equity exposure would have seen even less of an impact on their funded ratios through 2018 compared to plans with larger equity allocations. 2018 turned out to be quite a volatile year for equity markets and bond markets. Equity markets fell during the first quarter, rose during the second, and fell sharply in the fourth, finishing the year down from previous peaks. 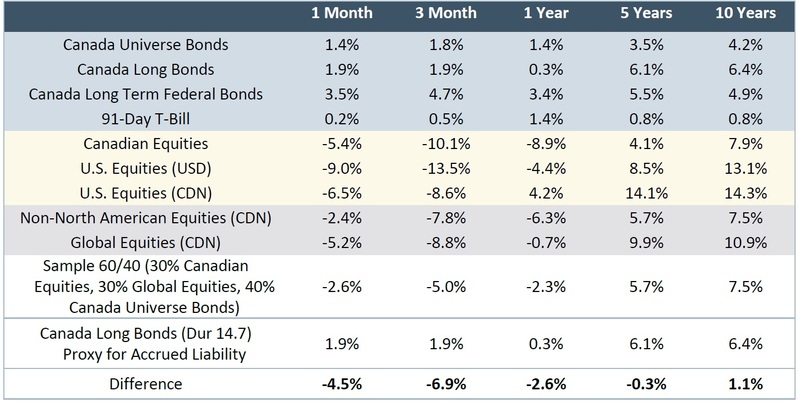 The Government of Canada long bond yields rose then fell, while corporate and provincial yields finished the year up from where they started at the beginning of 2018. Table 2: Period Ending December 31, 2018 Market Returns. Sentiment has turned. It is difficult to attribute the recent volatility to a single reason, but a number of contributing factors can help explain the decline in equity markets. The Chinese economy is showing signs that it has slowed significantly. The Chinese government recently reported the lowest growth figures in a decade (6.5% GDP growth for the year ending September). As another indicator, luxury automakers have reported a significant drop in Chinese sales over 2018. In early 2019, Apple shocked markets with reports of lower sales volumes in China. China also introduced capital controls in 2018, which led to a notable absence of Chinese investment in a number of real estate markets, including Manhattan, Sydney, and Vancouver. Rising interest rates and quantitative tightening. In December, the Federal Reserve raised rates for the fourth time in 2018 to 2.25-2.5% and signaled that it would stick to the current course of reducing its approximately USD4 trillion balance sheet. Rising interest rates may have had an effect on equity markets, as investors begin to factor in the impact of higher debt-servicing costs on companies and consumers. The withdrawal and unwinding of quantitative easingcould also have an impact. To date, equity markets have enjoyed an influx of capital as investors sought higher yields while central banks have kept interest rates low. As interest rates rise, this process may be going into reverse. Investors are uneasy about the rise of protectionism and global trade wars, particularly between the US and China. The tariffs imposed by the Trump administration and the retaliatory measures taken by China have concerned investors, who worry that a clash between the world’s two biggest economies could undermine global growth. The recent market events should be viewed in context. Since the crash of 2008/2009, equity markets have posted the strongest returns in a number of decades and the longest ever bull market run. A correction has been overdue by historic standards, and the business cycle has had an unusually long expansion phase. A recession would not be uncommon or unexpected at this stage in the business cycle. At PBI, we believe that pension funds are long term investors. Corrections and recessions are normal parts of the business cycle and are to be expected every 5 – 10 years. Large recessions or depressions such as 2008/2009 are 50 – 100-year events. However, pension plans have to invest and pay benefits for 100+ years and therefore need to endure a number of economic storms over their lifetime. We believe strong risk management is essential to prepare our clients to weather these storms to meet their goal of paying pensions. To use a maritime analogy, PBI believes in preparing the ship for the storm before it leaves port. During and after the storm, evaluating the effectiveness of your preparation and seeking opportunities for improvement will enhance performance in the future, whereas changing course may be risky and ineffective. It is also important to remember that many of the plan’s assets are businesses, rather than simply stocks with a ticker. Choosing the right managers to pick the strongest businesses, real estate and infrastructure assets, borrowers, and securities will lead to long term success, rather than basing investment decisions on short term price movements. In summary, it is a good time to evaluate how effective your Plan’s risk management steps have been and to look for improvement opportunities. It is also a good time to see if there are good businesses or assets that can be acquired at an attractive price. Here are some questions plan sponsors might want to consider. How effective is your risk management process? How has your funded ratio been impacted? What have been the driving factors behind your change in funded ratio? If a valuation were to take place – would any additional required contributions be affordable? Have managers performed as expected – for example, have low volatility managers reduced volatility as volatility has increased? Are there any asset classes and strategies that were considered too expensive that are now cheap enough to enter? Do your managers (particularly the ones that you trust highly) believe opportunities have opened up and some good companies that were previously too expensive now offer better value?